Continued from Teenage Mutant Ninja Turtles #9. Casey, Shadow and April are back in their apartment. Jones is on the phone with his Mom, explaining recent events. Mr. Braunze arrives and asks Casey to take a walk with him. While the men transverse the streets of NYC, Braunze explains to Jones what’s really been happening. The federal agents following April and Jones are from D.A.R.P.A., a “Black Ops” part of the C.I.A. The feds want to know why the robot was after April and they’ve got Raphael. Casey asks how Braunze knows all of this info, and the bald man explains that he has a gift for finding things out. Braunze then tells Casey to get his friends, because he has a proposal for them. He also assures Jones that Raph is in the hands of a group so secretive that few probably know of his existence, and Braunze will honor the Turtles desire to remain hidden. Raphael wakes up in the hospital bed and breaks free of its binds. The mutant turtle then begins to search his surroundings, and discovers a room filled with strange, gigantic tubes, each containing some type of alien life form… one even houses a Triceraton! 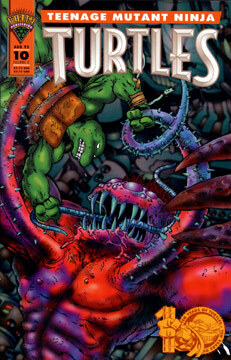 As Raph continues his reconnaissance, he’s suddenly attacked by a huge monster. As a struggle begins, two guards enter the room and shoot both Raph and his foe with stun guns. Braunze is meeting with the three remaining Turtles, Casey and Nobody. Braunze explains that he knows where Raph is being held, and that he’ll help the group rescue their companion. Braunze also states that he can set it up so once the Turtles return to New York, no one will bother them. Leonardo states that they have no choice, they have to agree to Braunze’s plan. Don isn’t so sure that they should trust Braunze, so in effort to win their confidence, the bald man explains his own origin. It seems that Braunze himself had been a member of the D.A.R.P.A. back in the 1950’s, and they’d performed experiments on many of their agents. A group of 18 men were given injections in hopes that their mental powers would be dramatically increased. The drugs killed some of the test subjects, but others had tremendous success. Braunze himself developed the ability to read minds and shape thoughts. Eventually, Braunze found himself in a situation where he needed to leave the C.I.A., but realized that they wouldn’t let him go, due to his abilities and knowledge – so he used his powers to fake his death. Nobody states that D.A.R.P.A. won’t be happy to discover that Braunze is alive, and the ex-agent flatly states that it’s his concern alone. Before departing, Braunze tells the team that they’ll need to get an early start, 4 AM. He also tells them not to bother to set an alarm, as he’s already implanted the wake up call into their minds. Three days later the group is driving a van in the Nevada desert. They hide the van and set out on foot. Soon enough a helicopter appears and divebombs past them – fortunately there’s another group of people on a hilltop ahead trying to spy on D.A.R.P.A.’s operation, and the helicopter was sent to chase them away.